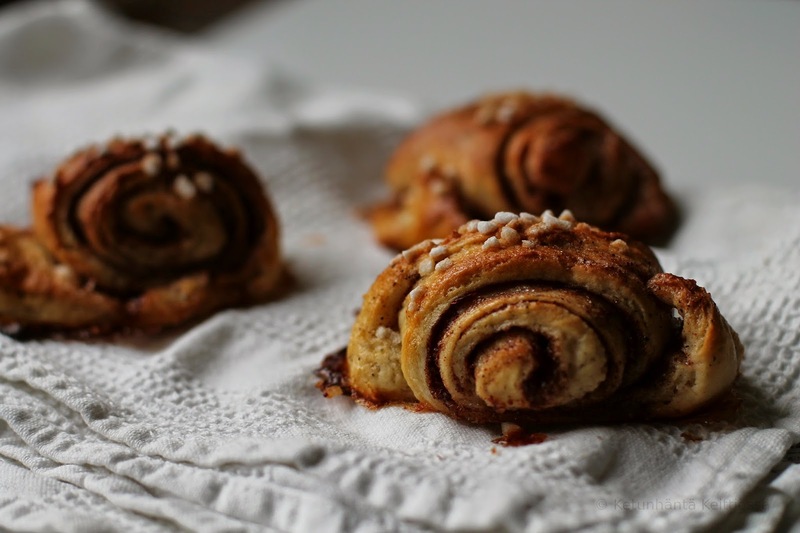 Cinnamon Bun Day is celebrated tomorrow (October 4th) in Sweden (Food Calendar stuff again). 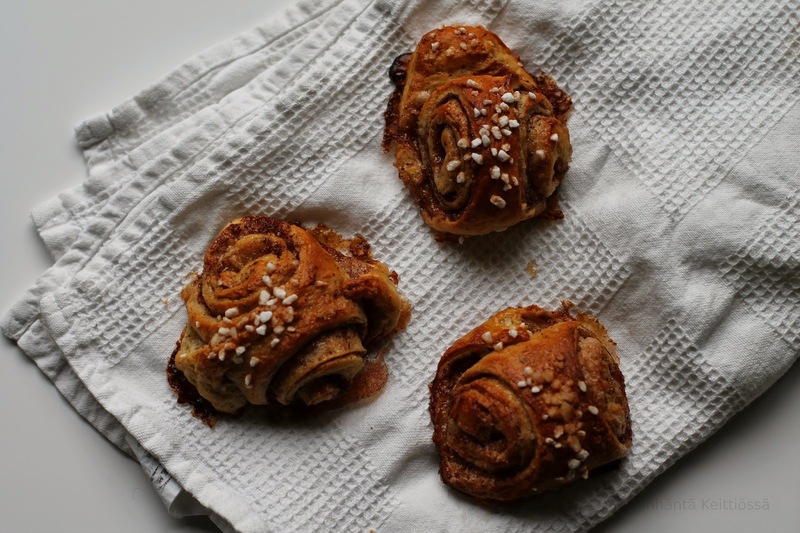 As cinnamon buns originate from Sweden (or that's what they're saying), theirs are more famous. 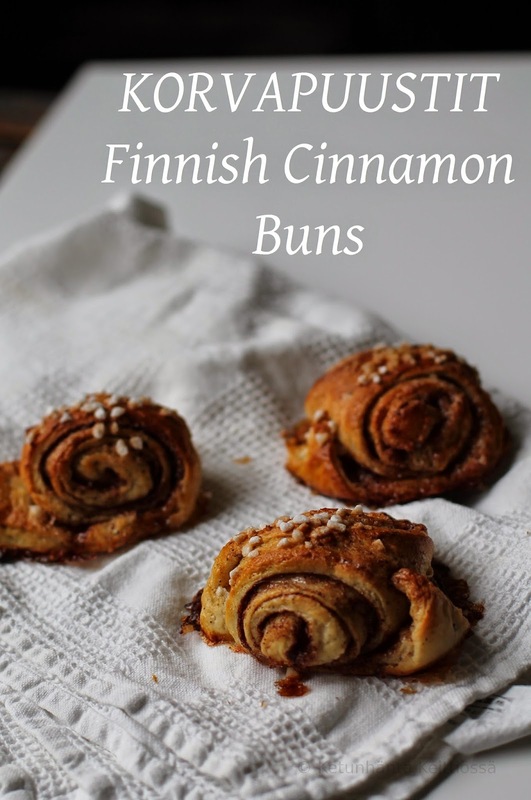 I'm posting this recipe so that you can try Finnish ones too. They differ somewhat from their Swedish "cousins". The name in Finnish means a sort of a physical punishment: pinch&pull of the ear (not slap! as I've noted in many translations). Former times bad children would get pinched and pulled at the ear (=would get korvapuusti). 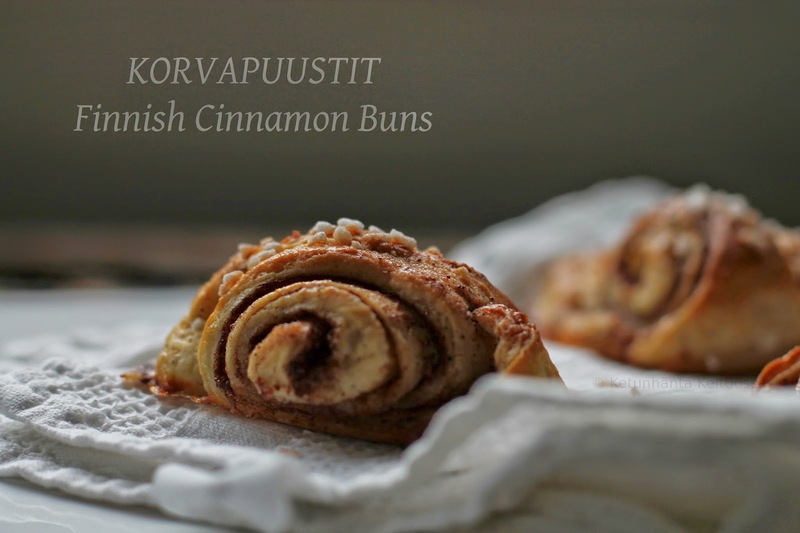 Nowadays physical punishment is prohibited by law, so hopefully nowadays children get only these sweet korvapuustis instead. The name comes probably from the bun's resemblance to ear lobes. I've made a notion that usually the visually impaired cinnamon buns are the most delicious. They tend to be moister than those that look picture-perfect. And my preference is towards slightly underbaked ones (probably the judges in The Great Finnish Bake-Off would call them "slightly raw in the middle"). I was planning on taking photos of the baking steps but the dough was too wet and sticking to the table, so I didn't bother washing my hands all the time for the sake of photos. 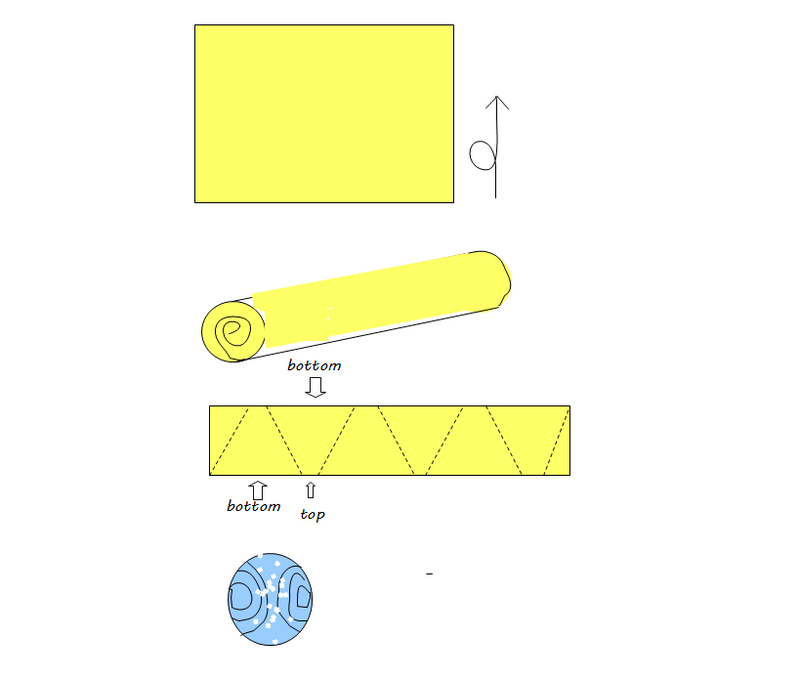 Instead, I've drawn instructions on how to roll the buns. Oh, and please don't premix the filling but spread the butter first and then sprinkle the dry ingredients on top of the butter layer. 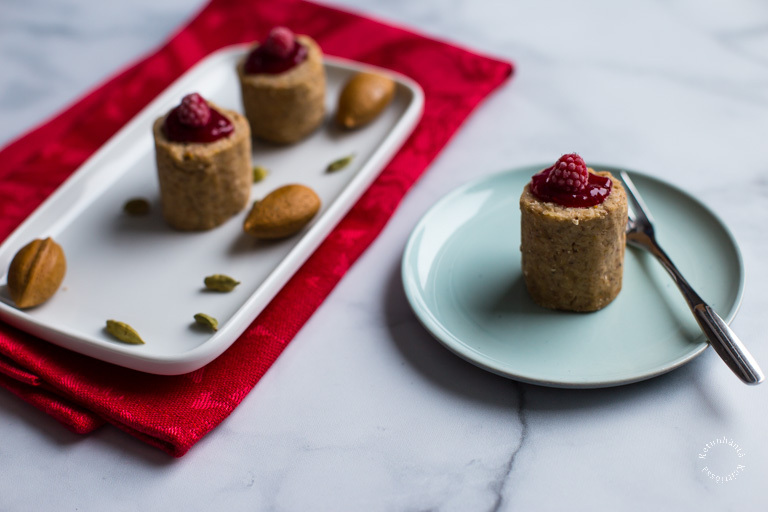 It really impacts the taste and texture whether making a paste or spreading butter and dry ingredients separately, although one would maybe expect otherwise. Egg (beaten) or milk for "eggwash"
Make the dough according to Shrove Buns' instructions. After you've let it rise once, knead the air out of it on a floured surface. Roll appr. 30x40 cm rectangle (the long edge facing you). 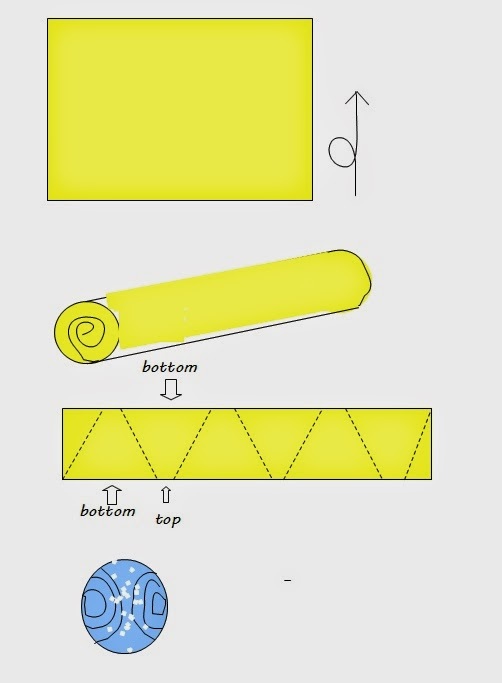 The thickness should be around 3-4 mm: enough to roll it easily but not too thick as to make the buns too big (they would bake into odd shapes in that case.) Spread the softened butter so that it covers the whole rectangle (the amount of butter is up to you. I think I used appr. 3 Tbsp for a dough of this size). Like you would butter a toast :D Sprinkle on the sugar and cinnamon, generously (maybe 3 Tbsp sugar, 1 Tbsp cinnamon. Sorry, I never measure them...). Place buns on baking tray, the broad edge (labeled "bottom" in the picture) facing the tray, the short one (labeled "top") upwards. Press down on the short edge to mold them into "ear lobes" (the blue bun on the picture). Cover the buns loosely with kitchen cloth. Set aside in a warm place to rise until rolls double in size, about 30 minutes. Preheat the oven to 225 C. Once risen, brush the buns with eggwash or milk and sprinkle pearl sugar on top. Bake until golden brown (appr. 7-13 min, maybe closer to 15 min if you opted for big ones). P.S. Will you be spending your Saturday baking and/or eating cinnamon buns?